Finding a rug that suits your style is important, but it is equally important that it fits your space. Many rug shoppers assume they need a particular size for a room without ever measuring the area. This can create an inconvenience when you think you found the perfect rug, only to get home, lay it out and discover it is too small! Our guidelines below will help you avoid this by suggesting some tips for how to measure your space based on what room you are outfitting with a rug. Check out our What Size What Room handy rug size chart! DO set your furniture where you think is best for the room in living rooms, family rooms and dens. Measure the open space up to the sofa and chairs, making sure that when seated, both of your feet should be on the rug. DON’T “float” a rug in a room. DO anchor your rug to the furniture. DO be sure to get the appropriate padding for each surface if you are placing your rug over hardwood, tile or carpet. 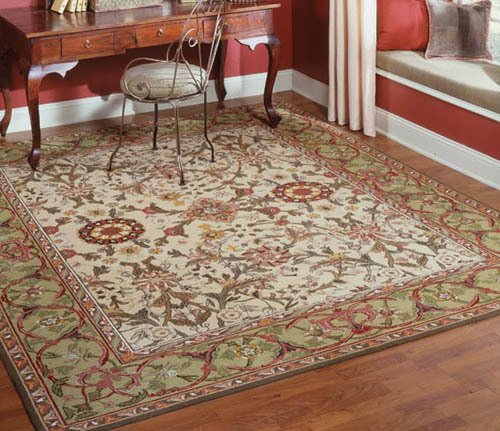 DO use your dining room chairs to help you measure what size rug you’ll need. Set up your dining room chairs away from the table with the amount of space you would need to sit down. Then measure across the length and width of your table taking the measurement to the rear of each chair leg. Add 8 inches to this total measurement. This will give you the minimum size rug needed. DO allow 3 feet on both sides if the rug is under the bed. DON’T place a rug in a room so that it ends in the middle of the doors or archway openings. DO allow about 8 inches of exposed floor around the baseboards on all sides when using a rug to cover most of the floor in a room. More than one rug is acceptable. Call Mark Gonsenhauser’s Rug and Carpet Superstore today at 757-486-6600 for more information on finding the perfect Oriental rugs in Virginia Beach.